At UCMAS, our whole-brain development program builds foundational capabilities through a series of in-class training activities conducted by our trained class instructors. These rigorous training techniques are based on pedagogical methods designed by child development experts to ensure our students can benefit from our program and be successful in life. Students boost memory power through visualizing numbers in their mind while handling the physical or mental Abacus. – Students create a mental image of the beads on their mental Abacus with the help of flash cards. Each student who completes the UCMAS program will have memorized over 450,000 images. Speed training encourages children to listen attentively and respond to questions quickly, sharpening their focus and concentration. From a purely mathematical perspective, Abacus-based mental math makes any arithmetic easy to understand. 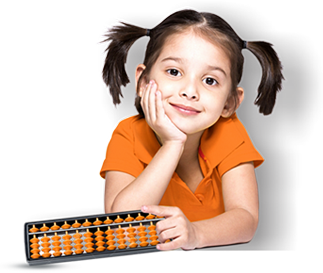 Understanding math through the Abacus inspires new perspectives: Children learn to subtract by adding; to multiply without multiplying; and to perform long division problems in their head faster than most people can add two numbers together. These are mathematical building blocks that complement the curriculum used in Canada’s public and private schools. Our program supports and augments what students learn in school and in no way does it hinder academically. Through our innovative and exciting teaching methods, students learn techniques that will stay with them long after they’ve completed the program.